A father from Aurora, Colorado managed a last minute rescue of his daughter and two other girls from the nightmare of travelling to Syria. He said hed had no previous indication that she had been radicalised, but that his intuition kicked in when he discovered that her passport was missing and he found texts to Lufthansa airlines and a local taxi firm on her phone. Once his daughter was home safe he learned how ISIS tricked his daughter and others over the internet. This put me in mind of a young Iranian woman I got to know in London in 1996 just as I was on the point of finally severing all ties with the Mojahedin Khalq (MEK) terrorist cult. Interestingly it was through Neda Hassani that I met my future husband because she worked in the MEKs Westminster based PR office where he was also stationed and I was sent to work with her. How ironic it seems now that while Massoud and I were leaving, she was getting more deeply involved. Like ships in the night we passed each other by, unaware of our future destinies. Even at the time I remember trying to talk to her and explain that the MEK are not what she thought they were. But of course, the radicalisation process had already begun and she couldn’t heed my warnings. Neda was in London for only a brief time before being dispatched to the military training camp in Iraq. Her parents had sent her from Canada after she had finished her studies and had just begun working. Neda had told me she hadn’t wanted to leave Canada and that she enjoyed her new job there. But the MEK had persuaded her parents that she would be in moral danger if she stayed in Canada, that she would abandon her Iranian upbringing and become a wild, immoral girl, taking drugs, drinking and having a series of boyfriends. Of course, anyone who met Neda could instantly see that she wasn’t that kind of person. Her parents should have been tremendously proud of this kind, thoughtful, ambitious young woman who exuded joie de vivre. Instead, the MEK tricked them into believing that their harsh military camps in Iraq were the ideal place to keep her safe from bourgeoise Western corruption. The MEK, they were told, promoted women and gave them responsibilities above men. Neda, they were told, would be at the forefront of a noble struggle to free Iran and that she would remain celibate until after the revolution. As long-time peripheral supporters of the MEK, Nedas parents had no idea of the reality behind the lies and propaganda. They had no idea of the cultic abuse taking place in Iraq turning ordinary people into disposable brainwashed gladiators. 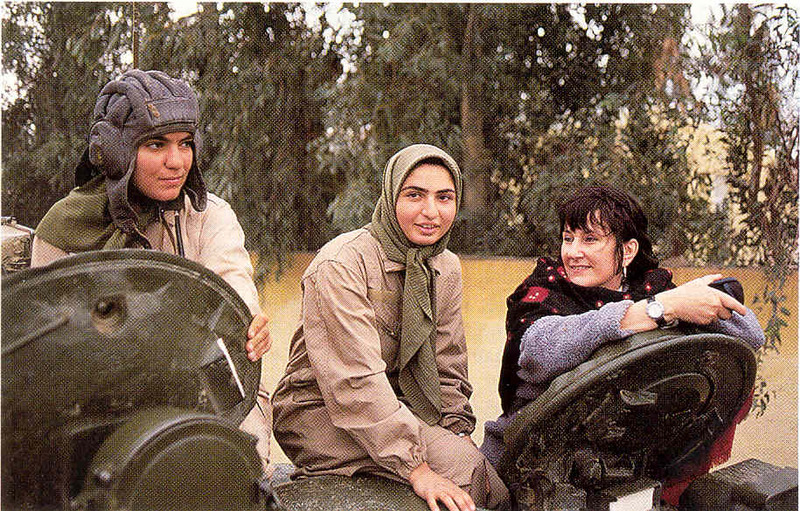 The next time I came across Neda was in a photograph for a magazine article taken in Camp Ashraf showing her sitting on a tank with another combatant looking relaxed and happy. The writer had clearly been easily fooled by such appearances and wrote in glowing praise about the women there. This was in direct contrast with another article The Cult of Rajavi by Elizabeth Rubin in The New York Times magazine on July 13, 2003. Rubin had also visited Camp Ashraf but was not fooled by the MEKs talk. She graphically described the cultic conditions in the camp, and the bizarre behaviour of the group and its members, especially the women. This article was published one month after Neda Hassani’s death. Neda died from her injuries after setting herself on fire in London to protect MEK second-in-command Maryam Rajavi. Rajavi, who had been arrested on terrorism charges in Paris only days before, ordered several members to commit self-immolation to force the French government to let her go. Neda’s family found a poem to Maryam Rajavi written the night before she died which said “Against the flow of savage winds, I give my spirit to protect you”. What kind of brainwashing does it take to get a young woman who has everything to live for to kill herself so that someone else wouldn’t have to face criminal charges? As a leader of a terrorist cult, Maryam Rajavi had already ordered the deaths of thousands of Iranians and Iraqis. This was business as usual for her. But Neda’s death wasnt even for the cause her parents believed in. They sent her to Iraq to struggle for the freedom of the Iranian people, not the freedom of a vain and cruel woman. Former members of cults like the MEK are familiar with the deception and psychological manipulation exerted on the members. They now see that young people in Western countries are being deceived in much the same way by ISIS. Fortunately for the young women in Aurora, at least one parent was vigilant and courageous enough to rescue them. I like to think that Nedas parents very quickly became aware of their mistake. Certainly when her mother was asked if others should follow her daughter’s example she told reporters: “I hope not, I hope not. I don’t know what lesson can be drawn from this except that every society needs to learn about deceptive recruitment and cultic abuse. People – young and old – who know how deceptive psychological manipulation is used will not succumb to its persuasions.